3Dconnexion creates six-degrees-of-freedom controllers for the CAD and graphics industry. They are widely used by engineers and designers because the controllers allow them to easily navigate 3D space in their favorite CAD programs. These are solidly built and very accurate. They are not a cheap joystick-like controller, that’s for sure. The accuracy and solid build makes these controllers excellent for gaming. Are you affiliated with 3Dconnexion? No. But we support their efforts to make their controllers more accessible to developers through their excellent SDK and support. We don’t sell controllers either. We just enjoy using them. Do I require a 3Dconnexion controller to use ControlMyJoystick? No. But you can still use voice commands even if you don’t have a controller. You can optionally use a 3Dconnexion controller as a source of triggers and axis data. They have been selling these for years for use with CAD and other 3D design apps, and they are really nice to use for games – especially where six degrees of freedom is needed: up/down/right/left/forward/backward plus rotation around all axis. Let’s take a look at what is involved with getting these controllers to work with ControlMyJoystick and games. From here on it, we’ll refer to them as ‘controllers’. 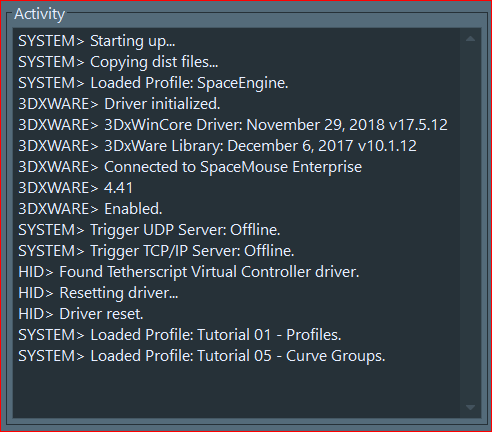 You must install the 3DxWare driver software, which is available from the 3Dconnexion website. This software has some good practice apps so you can get to a feel of how to use the controller. It also has a Menu app that pops up when you press certain button on the controller. This Menu app can be used to configure the controller for use with an application. 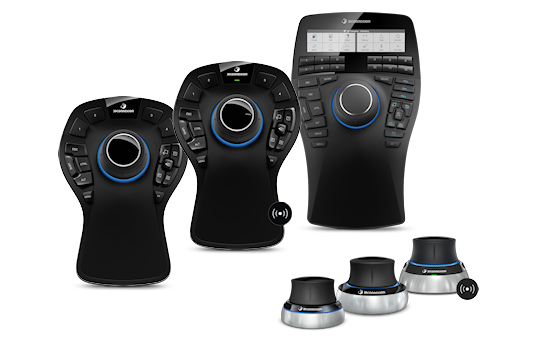 You tweak axis orientation and sensitivities and remap the buttons to perform different actions. If you go to a game and use the controller and it’s Menu app, it will create a new .xml file if it does not already exist. Take a look at the .xml file and you will see definitions for axis sensitivities, button mapping and more. You can manually edit the .xml file or use the Menu app to modify the settings in the file. – No user-adjustable curve support or curve switching while in-game. – No support for a proper deadzone or trim. – No jitter reduction (from shaky hands). – No way to launch macro’s with buttons. So, it really isn’t meant to be used in games this way. You can get close by hacking the .xml files, but it still doesn’t get you to a point where it feels like an effective controller. Specify a sensitivity (response) curve per axis. This is done via curve presets and a drag and drop curve node screen. Specify axis inversion, trim and deadzone. Set an overall jitter reduction for all games. 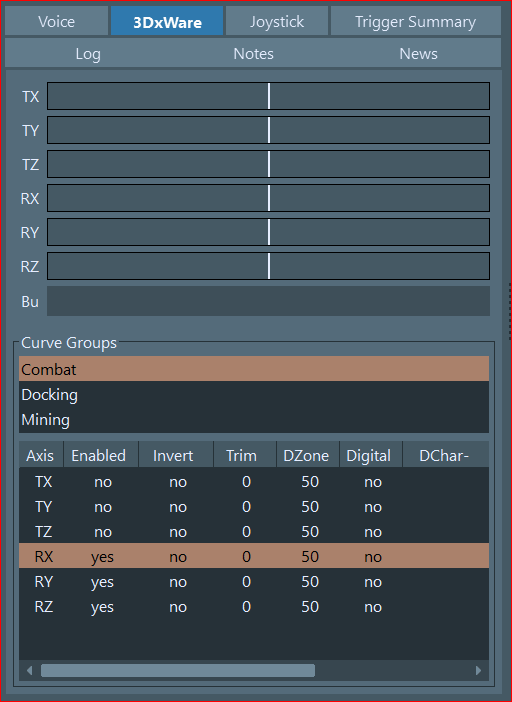 Create axis curve groups so that you can have different response curves for different gaming phases, such as landing and combat. You can use a macro to switch between these axis curve groups while in-game. The install also adds a Tetherscript Virtual Controller driver. ControlMyJoystick will take controller axis data, apply curves to it, and then pass it through to the Tetherscript Virtual Controller driver. Then game then needs to read the joystick axis and button data from this driver. This can be tricky because the game may be able to see both the KMJ driver as well as the Tetherscript Virtual Controller driver. You can either disable the KMJ driver (not a great solution, since you may want to use the controller for something else, like CAD), or you can use ControlMyJoystick’s special voice-activated axis binding commands or the non-voice binding commands in the Joystick menu. This will ensure that the game is listening to the Tetherscript Virtual Controller instead of KMJ. – Enabled – Check this box to allow ControlMyJoystick to communicate with the controller. This is what you will see in the log when you enable the controller. 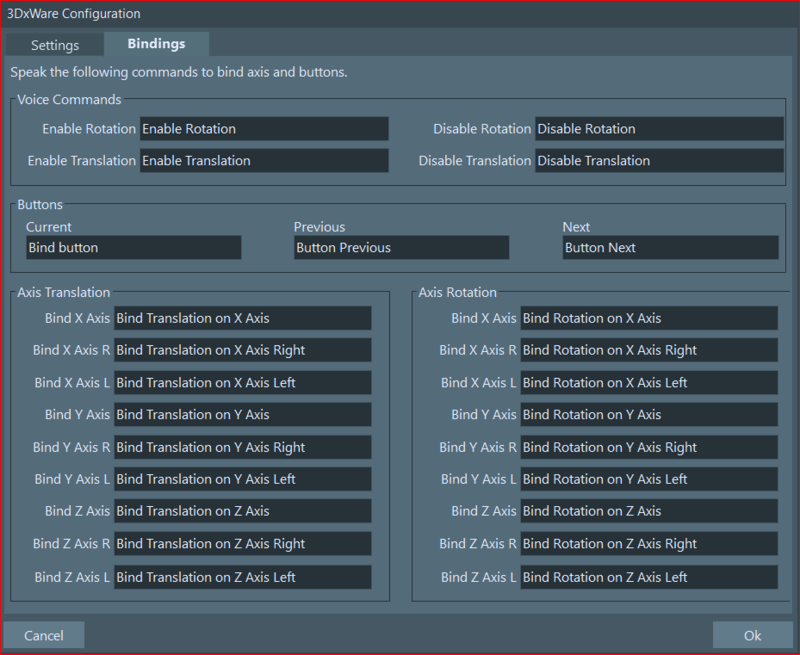 – Show Axis Values – Check this box to show the real controller axis values in the 3DxWare sidebar panel. – Smoothing – Check this box to reduce the jitter or shake that is caused by shaky hands. Since the controller ‘puck’ moves very small distances physically, any amount of shake can be magnified. Using smoothing introduces a bit of controller lag, with the higher Depth values causing more lag since it goes back and averages controller axis values to the specified Depth. So a depth of five will average the last five axis values. Default value is two. You can compare the raw axis input data with the smoothed data in the curve editing screen – it will show on the bottom response indicators. One will be jittery, the other will be less jittery. – Tap Trigger – You can set the sensitivity and timing of tap recognition. Tapping is recognized on the controller puck Z axis only. You can use these taps as a trigger. NOTE: You don’t have to use voice to bind axis or buttons. You can instead use the Joystick menu or the Test menu item in the Joystick sidebar popup menu. – Bind Button – Speak this phrase while the game is ‘active’ or ‘focused’ to send the currently select joystick button press to the game. – Next Button – Bind the next joystick button in the list. – Previous Button – Bind the previous joystick button in the list. – Axis Translation and Axis Rotation Binding – Translation is the side to side- forward and backward and up and down motion of the controller puck. Twisting the controller around an axis is rotation. Just like the joystick buttons, you need to use voice commands to bind controller axis movement to your game. You can create your own binding commands if you like. Just enter the commands in the screen shown above. Why, do you ask, are we using voice to bind joystick buttons? It’s because the some games may be listening to the KMJ driver instead of the ControlMyJoystick driver. By ensuring the game is ‘active’, and using the voice commands, it will bind to the ControlMyJoystick driver instead. Other games allow you to specify which driver to use, which makes binding easier. Try moving the controller puck and you will see the axis indicators move in the 3DxWare sidebar panel. When you create a profile, a Default curve group will be created and all your curve edits will be in that group. You can rename the group, or create a new group by right-clicking in the curve group list. You can switch between groups by clicking on an curve group or by changing it with a script command. So, by using your voice or a controller button, you can change the active curve group and use different curves. This is very useful for different phases of a game, such as landing or combat. Double-click on a curve, in this example, RX (Rotation around the X axis) to bring up the curve editor. This will edit the RX curve. These curves are what really makes using the 3Dconnexion controllers in games a real treat. To adjust a curve, click and drag one of the control points which is located along the curve line. You can’t remove or add control points. The curve shown above is a preset available from the Curve Presents button. It is called ‘Soft – No Explicit Deadzone’. You can tweak this curve and you can reset it back to a flat line with the Flat preset. Try moving the controller puck along the RX axis (move the puck from side to side or left to right). The un-curved axis data is represented by a small tick at the top of the axis indicators, and the curved data that will be sent to the virtual joystick driver is shown as a longer tick at the bottom. Try checking the invert box, and you will see how it works. – Enabled – Check this box to enable the axis. Sometimes you’ll want to disable an axis. – Invert – Check this box to reverse the axis values. Some games allow axis inversion, and you can do it there if necessary, or here. – Trim – You may have a controller that is miscalibrated and doesn’t seem to return to center when you take your hand off the controller. You can set a positive or negative trim value to ‘zero’ the axis value. – Deadzone – You can set a value here so that any movement of the controller puck within the deadzone value of center will be considered as center. Most curves will have a deadzone of some kind since that without it, the controller is just too sensitive around the center position. Setting a deadzone this way is called an non-explicit deadzone. An explicit deadzone can be achieved by setting the deadzone to zero, and then by dragging the near-center curve nodes down to zero. Either way, it’s a deadzone and both techniques give the same results. – Digital – Use this to enable Digital Joystick emulation, where you can send keystrokes to the game when you move the controller along the axis. This allows you to map a key in-game to scroll whenever the axis goes positive or negative, and to stop scrolling when it returns to zero. You can do this for each axis. This is useful for games where you need to scroll alot (like on a map, or overhead kind of game). Users often map the WASD keys for this, and you can do the same here. – Digital Enabled – Enables digital joystick emulation for this curve. 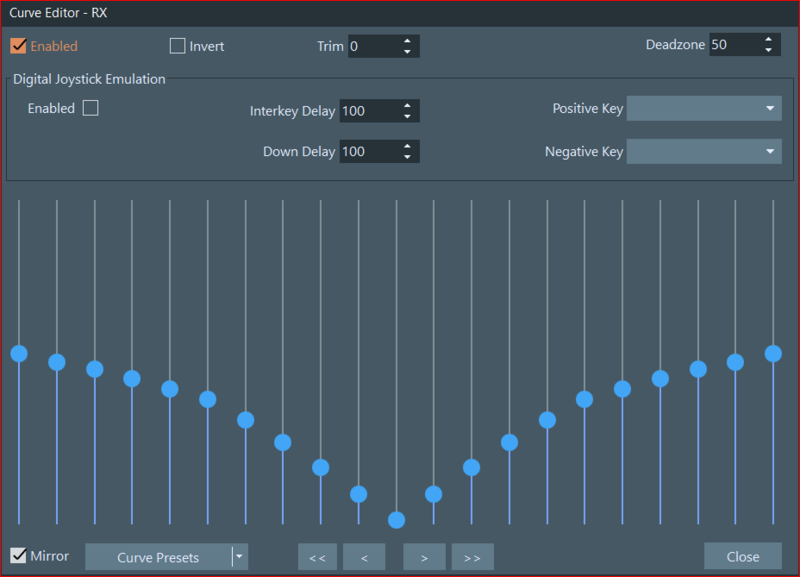 – Digital Interkey Delay – The time between the key-up and key-down, in milliseconds. – Digital Down Delay – The duration that the key remains down, in milliseconds. – Digital Positive Key – The keystroke that is sent when the axis value is positive. – Digital Negative Key – The keystroke that is sent when the axis value is negative. 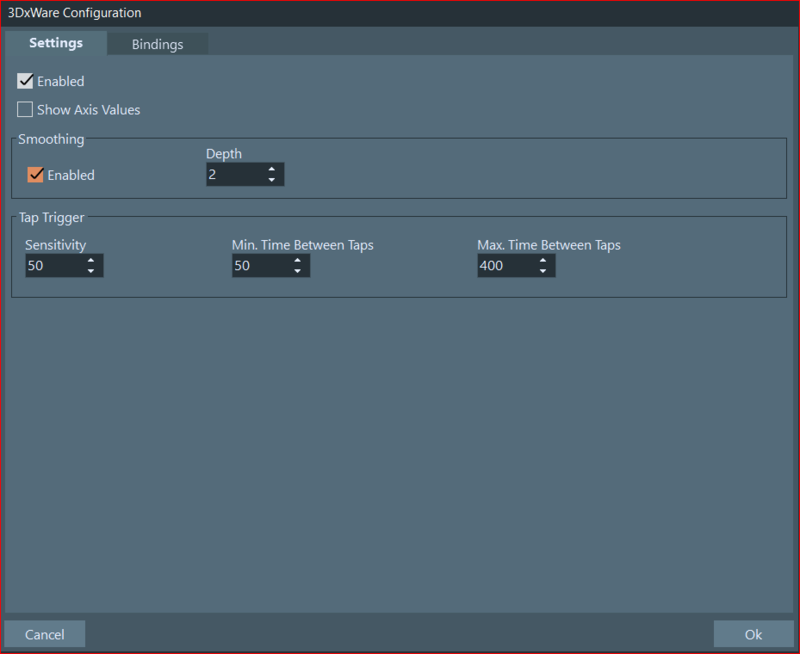 – Mirror – Check this box so that when you drag a curve controlpoint, the corresponding controlpoint on the other side of center will also move to the same value. – << < > >> – Use these buttons to move the entire curve up or down.